Once one of the world's top three phone makers (this was in the last decade, when Razr clamshells were selling like hot cakes), Motorola is, now, overshadowed by Apple, Samsung, LG, and others, all of which are selling way more smartphones. Nevertheless, Motorola Mobility (currently a Lenovo subsidiary) still makes good handsets, while also managing to cover all price ranges. If you want to buy a new Motorola smartphone, but you're not sure exactly what to choose, check out our selection below: we think these are the best Moto handsets you can currently get in the US, from the most expensive to the cheapest one. If you have a favorite Motorola smartphone (from the models released in the last couple of years) that's not on our list, feel free to tell us about it in the comments section! Undoubtedly the most powerful Motorola handset to date, the Droid Turbo 2 (known outside of the US as the Moto X Force) is available since October last year, and offers something that you can't find on any other smartphone: a shatterproof display. That's right, the 5.4-inch Quad HD screen of the Droid Turbo 2 is guaranteed not to shatter or crack for 4 years - though you can scratch it, so trying to destroy it intentionally is obviously not advised. Another highlight of the Droid Turbo 2 is its fast-charging 3760 mAh battery, which offers up to 2 days of usage on a single charge. The handset also features an octa-core Qualcomm Snapdragon 810 processor, 3 GB of RAM, and 32 GB / 64 GB of expandable internal memory. Granted, the Droid Turbo 2 is not exactly the prettiest high-end pone out there (though you can customize its aspect via Moto Maker), but that's not its purpose anyway. This is a very capable and tough device that you should consider buying if you don't want to worry about broken screens. Recently updated to Android Marshmallow, the Droid Turbo 2 is available in the US only on Verizon Wireless, starting at $26 per month, or $624 outright. Sporting a 5.7-inch Quad HD display, the Moto X Pure Edition is slightly larger than the Droid Turbo 2, but not as tough or as powerful. Unlike the Droid Turbo 2, the Moto X Pure relies on a less potent six-core Snapdragon 808 processor, while its screen is obviously not shatterproof. Still, the Moto X Pure performs well in almost any situation, and its 3 GB of RAM certainly help it achieve that. Similar to the Droid Turbo 2, the Moto X Pure has been updated to Android Marshmallow, supports microSD cards, and has a 5 MP front-facing camera with its own LED flash, plus a 21 MP rear camera (these cameras aren't the best out there, but they're definitely superior to what previous Moto X models offered). Normally, prices for the Moto X Pure Edition start at $399 unlocked (16 GB variant), but Motorola often offers discounts down to $299. Even if you want to customize it in Moto Maker with leather or wood backs (these cost extra $25), the Moto X Pure remains an excellent smartphone for its price range, especially if you're looking for a large device. The Moto G (2015), aka Moto G 3rd generation, is the first in the series that can be customized via Moto Maker - which is quite something for such an affordable handset. Building on the success of previous Moto G models, the Moto G (2015) won't impress anyone with its specs - including a 5-inch 720p display and a Snapdragon 410 processor - but it's one of the best unlocked smartphones you can currently purchase for under (or around) $200. Not only that it performs well in everyday tasks, but the Moto G (2015) is also water-resistant, and offers very good battery life. Moreover, the handset already runs Android Marshmallow. Prices for the Moto G (2015) start at $179.99 (unlocked), though that only gets you the variant with 1 GB of RAM and 8 GB of storage space. If you want the 2 GB & 16 GB model, you have to pay $219.99. Unlike in 2014 and 2015, Motorola this year didn't release a Moto E. Until that happens (if it does), the company's best super cheap handset remains the Moto E (2015), which has been available since February last year. Slightly larger than the original Moto E, the 2015 model can be a perfect choice for first time smartphone users, for those who need a reliable backup handset, or for folks who simply don't want (or can't afford) to pay too much for a new smartphone. The Moto E (2015) sports a 4.5-inch display with 540 x 960 pixels, and is powered by a quad-core Snapdragon 410 processor (as long as you're getting the LTE version). There's 1 GB of RAM and 8 GB of expandable storage space on board, while a 2390 mAh battery offers longer than average usage times. The phone still runs Android Lollipop, but Motorola promised it would updated it to Android 6.0 Marshmallow. At the moment, Motorola is officially selling the Moto E (2015) for $119.99 unlocked. However, you can buy the phone for under $100 if you're getting it from Amazon. You can also purchase the handset from various carriers, including Verizon, AT&T, and Sprint. Any of y'all seen the new X4 and G4 leaks? Mother of god...FUGLY. Some people prefer bigger screens and don't see it as a status symbol. I've had a 5 inch device since the HTC DNA since 2012. In over 4 years, I'd expect a bigger screen device. They should also make one smaller for those who prefer a smaller device. But don't blame it on a "Status" symbol. Or else everyone would be walking around with a big ol' tablet skipping each other. Tablets? Hmm... You've got a point, in all honesty... Perhaps that's because tablets tend to be too much of a handful for day to day usage? But there's a reason behind why all budget smartphones targeted at price conscious Asian Markets are getting FATTER & BULKIER... Oh well... Perhaps in too curious, eh? The Asian market is the biggest market, no? I agree to a certain extinct with you. 5.2 inch devices are adequate. I use a note 5, but I love using the wife's S7. Fat and bulkier should equate to bigger battery, not poor design. A big phone as a status symbol? Lol ok. I guess I'm top of the rank if I carry a 6 inch phablet everywhere. For real, tho. We may be witnessing the downfall of such a good company. Motorola is a "ME TOO" brand that lack any innovation. Not much unlike Suzuki in motorcycling, and even car world (to a lesser extent)... I won't be surprised if it take a dirt nap, and I certainly won't be happy... I've some great memories associated with my (now deceased) RAZR... I'm an old man who still believe in sentiments...! 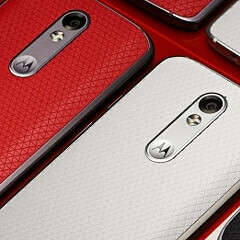 Would love to see Motorola back in relevance... G'Day Mate! Or is it LASS? RIP last great phones by Motorola (aka 2015 models). I don't think that Motorola is doomed... The pure Android is what differentiates it from other brands... A worthy contender for Nexus Fans, like me... Motorola Moto G is like a glorified AndroidOne... Super fast and highly stable due to lack of poorly optimised (usually) UI customizations... Hate to say it but only Samsung Touchwiz can out muscle Pure Android... Samsung really KNOWS how to optimize! Hats off, Sammy! Just get rid of all that boat and you'll be MY HERO...! LOLz! G'Day! Yup! Irony's but true. The best selling launcher Nova prime is also build on top of stock Android good and feel but extend greater customization such as icon size, grid layout and gesture support. This stupid Greenman think that Asian like large screen device more than small one,which is not true. Everybody loves handy devices,that's why mi5 is a great device. I think the Nexus 6 would be the best Moto to buy today.